Once again, a group of local musicians are getting together to help make this holiday season a little merrier for those who are economically disadvantaged. 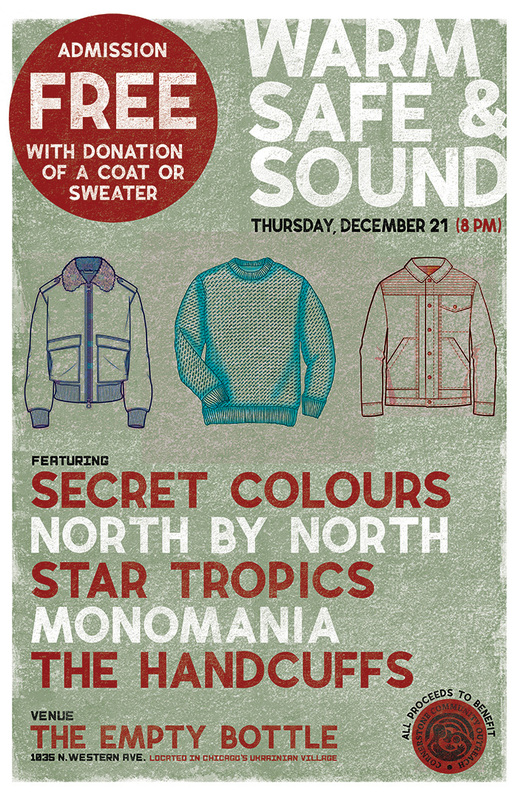 In 2011, musician Matthew Kayser started Warm, Safe & Sound, a concert and clothing drive that will be held Dec. 21 at the Empty Bottle, 1035 N. Western Ave., Chicago. 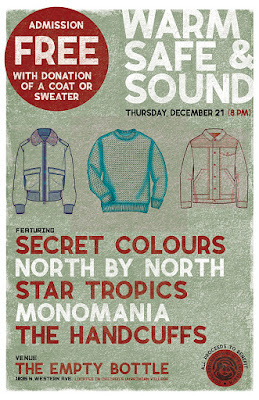 The concert will feature North by North, Secret Colours, Monomania, The Handcuffs, and Star Tropics. Tickets to the show are $10, or free with a coat donation. The organization that will receive the clothes is Cornerstone Community Outreach. Tickets are available at www.eventbrite.com. Q. Great talking to you again. You started Warm, Safe & Sound in 2011. Has it lived up to your goals? What goals do you have for this year's event? Thanks for reaching out. I've been very pleased with what we've accomplished with Warm, Safe & Sound. We've been able to gather thousands of coats and sweaters for our fellow Chicagoans. This year should be even better. My goal is to gather 250+ pieces of clothing. Between the top-notch lineup, the legendary venue (The Empty Bottle), the timely cause, and the assistance of the fine folks at Cornerstone Community Outreach, I'm confident that we will top our goal. I'm thrilled at the prospect of helping some of our homeless neighbors. Q. How did you go about putting together this year's lineup of bands? How do you think this year's lineup stacks up to past years? In the past, I focused primarily on booking bands that fit a certain style of music. This year I booked local bands that I knew would draw extremely well. To be honest, this time I wanted Warm, Safe & Sound to offer the best of both worlds. I believe it will, as I was able to build a bill that features buzz bands North by North, Secret Colours, The Handcuffs, and Star Tropics, all of whom are capable of packing out Chicago venues on their own. Having them all on the same bill and excited about the show is a godsend. Q. Congratulations on being a new dad. How is that going? Has that been a balancing act? Thank you! This pregnancy was exceptionally difficult for my wife, and we had our share of scary moments. Unsurprisingly, she was amazing throughout, and now we are beyond blessed to have a healthy son. He's our fourth child, but it's been 10 years since our last one. We are having to quickly relearn all the tricks of parenting an infant. It's slowly but surely coming back to us. And yes, it is always a balancing act. But I adore my family, my teaching career, and my music, so making time for everything is not as difficult as it might seem. Q. What can we expect from your latest musical project, Monomania, in the future? I am beyond excited about Monomania. I have reunited with Joe O'Leary, who was my guitarist in The Bright White, and our good pal Curtis Schreiber. Monomania is all about triumphant and driving rock n' roll, with a bit of jangle and a whole lot of energy. We are inspired by early R.E.M., Television, and Guided by Voices. Monomania is a brand new project, though, so we're still hashing out our goals. We do want to record in the early part of 2018. We will be making our live debut at Warm, Safe & Sound, so I can't wait to reveal the band to everyone. Good times ahead.